What could be more fun and exciting then seeing a group of Pasture piglets running through the warm, green grass of summer? Not much in my opinion! But does the thought of cold weather care make you want to cringe? Actually the care of Pasture pigs in winter doesn’t have to be that hard and shouldn’t make you reconsider your choices at all. We are familiar with both the Idaho Pasture Pigs and the Kunekune pigs, but a lot of what we will discuss will apply to other breeds of Pasture pigs as well. Probably the most important aspect for pigs wintering outside is that they have adequate shelter and protection from the weather and cold. We build A-frame houses made with two sheets of plywood on the sides and a triangle piece for the back. We use these same shelters in the summer months and with no floors the pigs are able to stay cool on the dry ground. In the colder months we fill the shelters full of straw or hay bedding to keep them warm. Five – six of our full grown Idaho Pasture Pigs fit comfortably in the A-frame shelters and they stay very warm and toasty. Many mornings, they will get up when I come to feed them and steam will billow out along with them. A lot of people think pigs won’t eat hay, but that is exactly what our pigs eat all winter. We feed a combination of alfalfa, clover, and grass hay. We put a big round bale or square bale into each pen and it gives them feed and entertainment for many weeks (and then we replace it with another one). Remember – most pasture pigs like to graze and having the ability to do that all winter will keep them more content and happy. If you aren’t able to put in big bales, don’t worry, they will be happy with a couple leafs of hay each day from a small bale. This will still give them the ability to “graze” and give them the added feed they require. We do feed a commercial pig feed also to supplement the minerals that our ground is deficient in as well as provide the extra protein they require during the cold months. For most people the “scary” aspect of winter care is watering their pigs. How do they get water? Are they getting enough? How will they survive? These are all questions I hear on a regular basis. If you have electricity and can have heated dishes hooked up, then it isn’t a concern. But most of us do not have electricity to any or all of our pastures. We solved this problem by buying a rubber feed dish for each pen. (we like the rubber feed dishes made for horses). Each day I simply put water into each pen using these dishes. I have learned to take them out when they are done or they play with them and it is like a treasure hunt the next day to find it again! 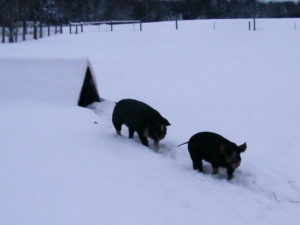 Pigs are also able to eat snow like many wild animals can and are able to get added hydration that way. The most important things to remember is that their shelter needs to be dry and warm allowing them to get out of the wind and weather and stay cozy. Good roughage for them to eat throughout the day is preferred as well as making sure they get the adequate protein and minerals they need. A drink of water will help keep them hydrated each day and will allow their digestive systems to function properly. Wintering pigs outside is both fun and rewarding if you let it be. 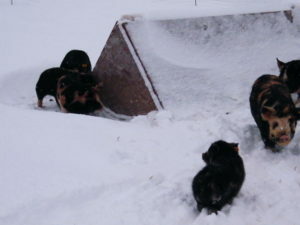 Enjoy the season and if you remember the important needs of your pasture pigs, they will too!